ARCHANGELS is a company based in God's Country (beautiful sunny Southern California), dealing in Rare and Unique Paper Collectibles. We specialize in vintage Comic Books, Original Comic Book Artwork, Hollywood Movie Posters and other related items as well. We are Senior Advisors to the Overstreet Comic Book Price Guide and a Charter Member Dealer with the Comics Guaranty, LLC (CGC). For other wonderful items, make sure to visit us at our About Me Page. 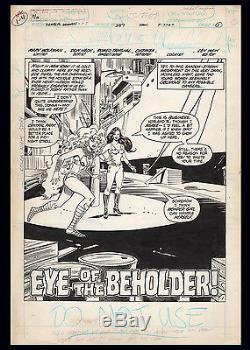 Wonder Woman #287 Title Splash Art by Don Heck with Teen Titans. Original splash artwork for Wonder Woman #287 (DC, 1982) by Don Heck (pencils) and Romeo Tanghal (inks). This impressive splash page features Teen Titan members Starfire (Princess Koriand'r) and Wonder Girl (Donna Troy) in the story, "Eye of the Beholder, " with beautiful full figure images of both heroes. Due to the fact that the Teen Titans book was only on issue #14 at this time, this piece represents a very early guest appearance by two of its main members with Tanghal being the main inker for George Perez (penciler) on the Teen Titans title itself. Artwork is in excellent condition with some very slight toning due to age and corner wear with image area approx. The item "Wonder Woman #287 Title Splash Art by Don Heck Teen Titans Starfire Wonder Girl" is in sale since Monday, September 28, 2015. This item is in the category "Collectibles\Comics\Original Comic Art\Splash Pages". The seller is "water-walker" and is located in San Diego, California. This item can be shipped to North, South, or Latin America, all countries in Europe, Japan, Australia.